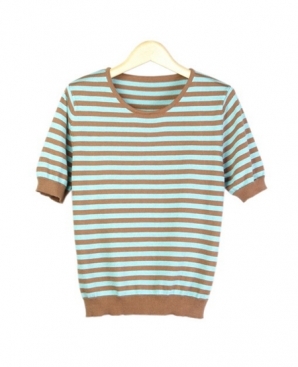 Our silk/cotton/cashmere jewel neck short sleeve striped sweater is great for all occasions. This crewneck sweater is easy-fit and clean shaped. 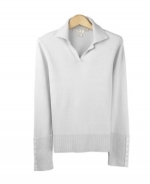 Ultra soft and a comfortable, luxurious top for the fall and winter. Matches many jackets and pants easily. 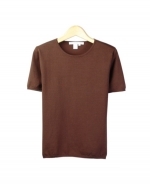 Dry clean for long lasting best results. Or hand wash cold, lay flat to dry. 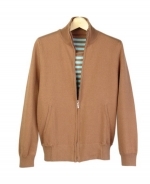 Steam or press the knit jacket with steam to achieve the original luxurious look and feel. 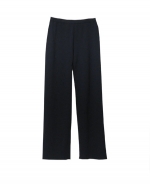 Women's silk/cotton/cashmere blend knit pants. The pull-on pants, tightly knit, matches its jackets.